We’re going to talk about bladders. 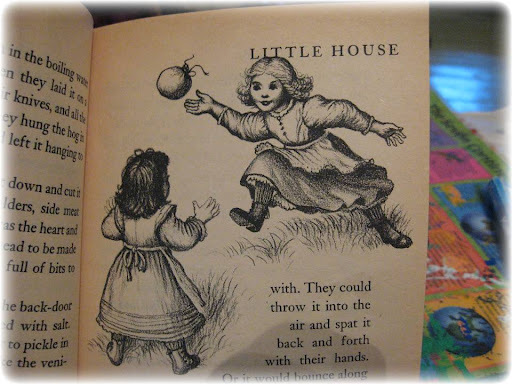 Not pig bladders, which, back in Laura Ingalls Wilder’s days, Pa blew up after the hog slaughter and let the girls play ball with. But women’s bladders. Or perhaps just my bladder. But I don’t think I’m alone. Which is why I’m sharing the love. I don’t remember my own potty training as a child. I suspect few of us do. 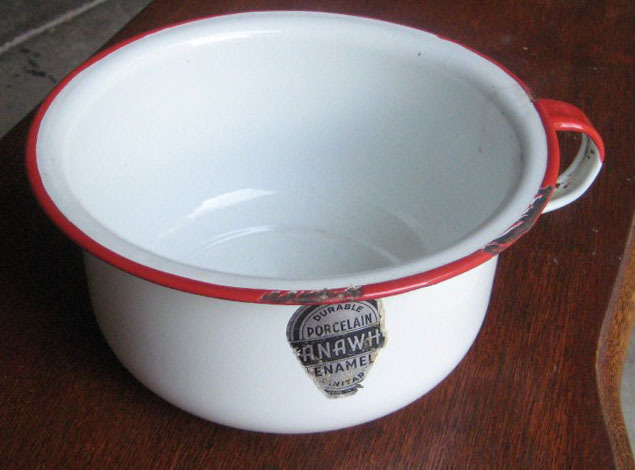 Although I do remember the little enamelware pot that I used. In fact, I still have it. I believe it’s at ex-Pat’s house, and should likely be rescued. It’s a rather odd childhood memento, but there you are. Of course, I remember potty training with my own daughter, but out of sensitivity to the fact that she’s a teenager, I won’t discuss any of the entirely entertaining stories I have about that here – yet. Unless she irritates me. Then all bets are off. Because the point of this post really is about my daughter. At least she’s the cause of the point of this post. Nor is there any other experience like pushing an entire human body through a hole the size of a quarter. I don’t care how elastic something is. Every piece of elastic reaches a stretch point of no return. Elastic…quarter…only one image missing, and I’ll spare you that. Following childbirth, many things get back to normal. But a few things don’t quite. You may notice that when you sneeze, you pee just a drop. Or if you laugh ridiculously hard, things get a touch moist down there. Exercise helps. Toning up those mushcles makes a huge difference. And you can do kegels until the cows come home and no one will be the wiser, nor will you break a sweat. (They’re great at stoplights.) These things WILL make a difference, and you may even find yourself better than ever. So back to this weird certain-age/bladder thing. This is new to me. Just like always, before I leave the house to catch the bus to work, or to take a long-ish car ride, I check in. Do I need to go? The answer is often, “Well, not really, but it wouldn’t hurt anything, so might as well, just in case. It will save any trouble later.” No big deal, right? It’s a precautionary measure. There is no sense of urgency, as one often feels when one actually needs to go. And so I enter a bathroom or a bathroom stall accordingly. Something I’ve done a million times over nearly 50 years. But here is where things are suddenly different. It’s as if my bladder has developed a brain of its own. It’s like the toilet is crack to my bladder. My bladder is fine up until the time it is within about two feet of a toilet, and then it becomes like a frenzied weasel. It must have that toilet. It must possess it. It MUST pee. There’s no stopping it. It doesn’t give a toot about the barriers of jeans and underwear that stand in its way. It’s going to go. So what started out as a blase visit to a bathroom becomes, within less than a minute, a desperate race against time to shed my clothes before my bladder decides to damn the torpedoes and go full steam ahead. Most of the time, I can beat it to the punch, though I’m sure it would be highly entertaining to watch my antics. Not that anyone will ever get to. But, given the nature of buttons, snaps, and zippers, the copious fluidity of some skirts, and the tightness of jeans, particularly on a hot summer day, sometimes I come up short. And then there’s some blotting and wandering around commando for the rest of the day. I mean, really, am I two again? Like I say, I’ve done this for almost 50 years and NOW I’m lapsing? WTF, bladder? Since when did you start making the decisions here, independent of my brain signals? It’s not enough of a problem for medication, and certainly not enough for Depends, and pantiliners are gross and uncomfortable and I had more than a lifetime’s share of them during pregnancy, so NO to that too. In fact, I’m not asking for any suggestions. I just needed to put it out in the open, because it’s not something we discuss, and as I said at the start, I’m pretty sure I’m not alone in this, so maybe it’s something we SHOULD discuss. So, you’re welcome. Now, if you’ll excuse me, I’m going to go do some kegels. Really enjoyed the photo. Happy kegeling–not a word I know, or at least I don’t think it is. I had the surgery for it (called a Marshall-Machette) about twenty years ago. The recovery was particularly painful, but so worth it. It bought me about twenty years though I’m sorry to say I’m in back in the same boat now.